First a story that maybe you can relate to ... She felt alone. Oh on the outside she seemed to have it all together and she kind of liked that people thought she did have it together, although often it just added to her loneliness because she felt she could never talk about the things she thought she was failing at. It was like this big secret standing between her and the people she wanted to have meaningful relationships with. Hmm, that was actually me. Some areas of my life were so good but some areas I felt like a failure. Have you ever felt that? I would lift everyone up but had massive hidden negative self talk. I discovered it all – even the things I was hiding from myself and learned how to make changes, wonderful, positive changes and now life is very different. Now I help women find their blocks and the things that hold them back from the success they most desire. With coaching you also can regain your power. Do you think you may have things holding you back? I will help you find them and change them. If you want something more out of life, but aren't sure what it is. If you've tried to make changes in the past, without success, or if you have a specific goal, but don't know how to achieve it .... I will help you. 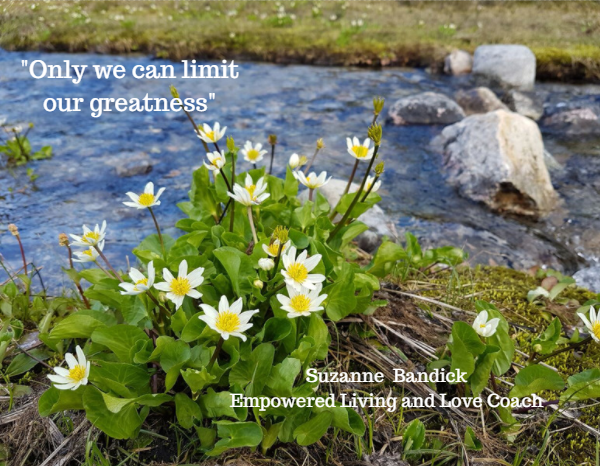 ​​​I am Suzanne Bandick and I have helped thousands of people from all over the world through personal and group coaching to empower and improve their lives. What do you want? ​to where you are going for your magnificent future. There are all kinds of questions and options. "Suzanne has changed my life – it happened from the very moment she began sharing with me her thoughts, her advice, and her knowledge. I was a different person one week later. I did everything she told me to do, in a week I started selling real estate again after a long period of bad luck, depression and a general bad state of mind. I started writing my wish list. I wrote what I desired, and with Suzanne’s help once a week, I was changed for good." "I practiced some techniques Suzanne taught me and the first thing I did was to get rid of the bad feelings left from a past relationship with a guy that didn’t deserve me. She told me “You have to look for someone that appreciates your generosity,” and that was it, I understood how worthy I was as a woman and I buried that relationship in the past and now I’m only looking forward. I am happy." "Suzanne, I asked to be inspired and you showed me the Law of Attraction, which has proven to be the MOST life changing experience to date! But I've always known you and your family were special and I've always thought about you and referred to you as the PERFECT FAMILY! Loving, kind, caring and amazing teachers to your, oh-so-fortunate, children, who when I met, (age 9-11ish), already had a vision board and goals before I, (age 25ish), even knew what they were!!! I'm so glad that I had the opportunity of meeting you when I did and I'm so happy that we've managed to keep in touch over the years!! Thank you for everything!" - Nickole, Vancouver, B.C. "Thank you Suzanne! My life has changed dramatically and continues to expand in joy and excitement. I'm having the most incredible life I never dreamed I could have! Have a fantastic day! Whether you realize it or not, you have taught me how to make each day fantastic." "I am so grateful to have you in my life and I am so in appreciation to be in this course. Thanks for the great coaching." - Cherilyn M.
Susie - learned she could create a great healthy relationship with her kids. Betty - learned she could have a better, wonderful, loving relationship with her husband. She now feels respected and loved. Tricia - found the love of her life - although he says he found her. Veronica - discovered she liked her work, was good at it and found recognition for it. Tina - discovered her passion and is now enjoying it as her successful career. Lisa - discovered her passion and is enjoying it as her hobby and now everything in her life has improved. Becca - got a new job and loves it! and they love her. Samantha - has learned to appreciate her value and feels more confident in all areas of her life. Maureen - has learned how to state her desires clearly and as a result is getting more things she truly wants in her life. Sonya - discovered she could balance her family, her work and her personal time with everyone winning because she feels good. Suzanne is a Canadian now living her adventure with her husband, Shawn, in Valle de Guadalupe, Baja California. Mexico. They moved to Mexico with their children who were then 8 and 11 because they wanted a change of culture and climate. Their children are now grown and pursuing adventures of their own so they moved to the Valle and are currently building a retreat to fulfill another dream of theirs. Suzanne has been Mentoring and Empowering others for over 15 years.